In 1405 Henry III constructed a hunting lodge here, but the first monarch to take a really serious interest in El Pardo's excellent deer and game hunting estate was Charles I of Spain (Charles V of the Holy Roman Empire), who built a sizeable palace here. His successor, Philip II, added many important works of art but most of these were lost in a fire in 1604, and after various architectural changes the building was finally reconstructed on Charles III's orders by 18th-century architect Francesco Sabatini; superb murals by Bayeu and Maella were added at this time. 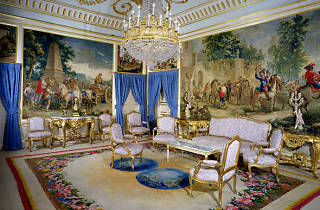 The current furnishings, paintings and tapestries were added during the 19th and 20th centuries. In addition to its main role today as a diplomatic rendezvous, the palace is partially open to the public and there are tours of its ornate and gaudy interior with its ornamental frescoes, gilt mouldings and some fine tapestries, many of which were woven in the Real Fábrica de Tapices to Goya designs. 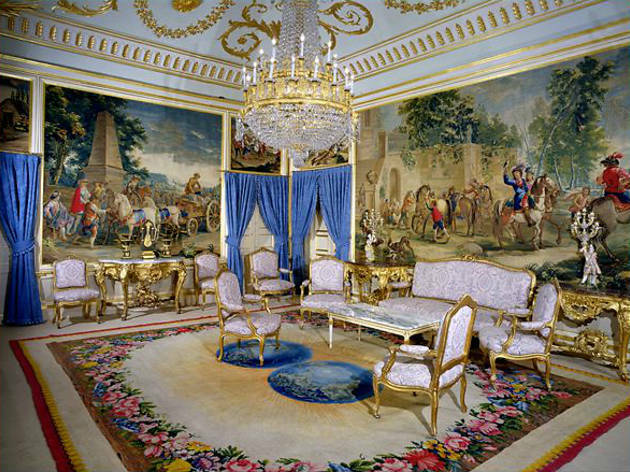 There's an ornate theatre, built for Charles IV's Italian wife María Luisa of Parma, where censorious film fan Franco used to view films with his cronies before deciding on their suitability for the great unwashed, but in truth the only rooms of real fascination are the Generalísimo's bedroom, dressing room and '70s bathroom - decorated to his own specifications. Outside you can wander in the palace's attractive gardens or explore or picnic in at least part of the magnificent surrounding parkland known as Monte de Pardo - even though much of this is still closed to the public. Other nearby highlights include the Convento de los Capuchinos (Ctra del Cristo, 91 376 08 00, open 9am-1pm, 4.30-8pm daily), famed for Gregorio Fernández's wooden baroque sculpture of Christ; the Quinta del Pardo, a small 18th-century summer house, and the single-storey Casita del Príncipe, built in 1785 by Juan de Villanueva and noted for its lavish lounges, though both have been closed to the public for some years. Open Apr-Sept 10.30am-5.45pm Mon-Sat; 9.30am-1.30pm Sun. Oct-Mar 10.30am-4.45pm Mon-Sat; 10am-1.30pm Sat. Admission €5; €2.50 concessions. Wed free to EU citizens.